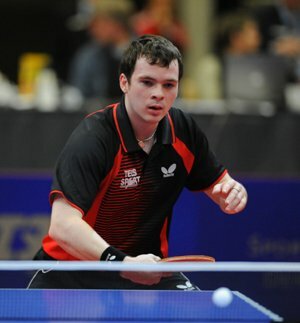 Paul Drinkhall is England's top table tennis player. Paul Drinkhall was born in Cleveland, England on 16 January 1990 and is the England number one and European (under 21 years) number one. He also has a World ranking (under 21 years) of number 6, and a senior World ranking of 82. Paul is making good progress up the rankings and is a player with plenty of promise. On 2 February 2010, I caught up with Paul Drinkhall and managed to ask him a few questions. Q Please tell us about your own web site. My website www.pauldrinkhall.com was launched around 18 months ago. It is updated every week depending on my schedule and if I am playing in tournaments. I also keep fans interested via a facebook fan page where you can also see exclusive photos and game footage. I am currently sponsored by Butterfly. They have supported me since I was 10 years old. Butterfly provide me with all of my equipment and clothing as well as sending me to select tournaments around the world. Their support is invaluable especially because of tight budgets for table tennis in the UK. Butterfly are a key in my success and without their help I would never have reached the level that I am today. Most of the top European players use the Butterfly brand. I use the Timo Boll Spirit Blade in the straight handle with Tenergy 05 rubbers on both the black and red side (both 2.1 thickness). I always play tournaments with new rubbers but if I am in a training camp then I will change them once every few weeks. I always use the same blade throughout the season. If during the off season a new blade becomes available I use the quieter time to test it out and discover if it will add anything to my game. At the moment I am very happy with the Butterfly Timo Boll Spirit Blade. I train at the National Table Tennis Centre (English Institute of Sport) in Sheffield and typically train for 7 hours per day. I do 5½ hours on the table plus 1½ hours of gym work - running and core strength training. I practice with as many people as possible. It's always good to play and practice against different styles of players. Whilst I do not officially have a single coach, I am coached by the current England Men's Team Coach. He has been coaching me since I was around 9 years old. Practice sessions vary between regular footwork (where you know where the ball is going) to irregular footwork (where the ball is played random around the table). We also concentrate on service and receive exercises where you play points as in a match situation. Not at the moment but possibly in the future. I am more focused on my training but will be producing some fun videos for my facebook page. Due to the lack of funding in the UK it is difficult to plan a schedule too far ahead and I tend to focus on the bigger tournaments. Over the past few years Butterfly have also funded me to play in a few European tournaments. I would love to play more tournaments and improve my world ranking but understand that due to budgets restraints it's not always possible. I am also contracted by Pluederhausen in the German Bundesliga. The club has 4 contracted players that play in the first team but only 3 compete in each match. Selection depends on players schedules, but I try and play as often I can. The main income in table tennis comes from Sponsorship deals and club contracts. Established players and high profile veterans of the game can earn decent money through appearances and exhibitions matches. Prize money in table tennis is not huge, but if you keep on winning, it adds up. I feel that to earn a decent living from the game you need to be in the top 100 players in the world or be a top ranked junior. I think it doesn't really matter how many changes we make to the game. It is going to be very difficult to get across to spectators how much spin is involved and the speed that the ball is travelling. To raise the profile of the sport we need to get as many people as possible to play the game and experience the sport. The sport is struggling financially in England due to budget cuts which effect the sport from the top down to the grassroots. But despite the lack of funding there are some talented players to look out for, especially Gavin Evans & Liam Pitchford. What makes them so good and what does the rest of the world need to do in order to overtake them? It is very difficult to compete with the Chinese. They have so many top quality players but I believe there are a few European players that have the ability to compete. Their dominance is due to table tennis being the National sport in China. They have millions of participants and thousands of professional clubs. It is similar to football in England where every young boy grows up wanting to be the best footballer. In China they want to be a professional table tennis player. China also has a bigger 'player pool' to select from, with fierce competition for International places. Finally, which of your table tennis achievements have given you the most pleasure so far and what are your goals for the next few years? Also, how long do you think you'll continue to play and have you considered what you will do after you stop playing? Best Achievement - Winning 3 gold medals at the European Youth Championships and remaining unbeaten throughout the whole competition. When I do eventually stop competing I would like to remain working in sport.